Tavern Ale is top-fermented, making it an ale. It is a medium to full-bodied beer with a hoppy aroma. Tavern Ale is served unfiltered resulting in a hazy or cloudy appearance. It has a full malt finish with a well rounded bitterness. Tavern Ale is an American Pale Ale because of the large amounts of American hops which lends a distinct, almost citrusy flavor to the beer. Therefore, our Tavern Ales is quite different from the "spicy" or "herby" flavor of European hops. This was another gift from my friend Gene. 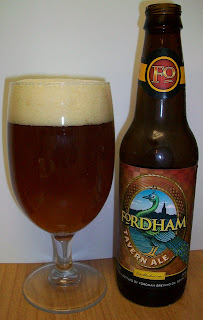 So far I have not had a bad beer from Fordham. I have never had this one so I’m really looking forward to this review. The beer pours a hazy copper color with a fairly rich an off white head. The nose of this beer reaches you as you’re pouring with caramel malts and floral hop aromas. The malt and hop aromas are very nice. There is a certain complexity of hop aromas. Just when you settle on one hop aroma with a gentle swirl more complex aromas are released. The nose also has a nice sweet malt aroma as well. Wow, that wasn’t bad at all. This beer has some malt and bite to it. The taste starts out with a slight malt sweetness up front on the tip of the tongue but that only last for a split second. It is immediately followed by a hop flavors and a very tingling effervescence over the tongue throughout the middle of the sip. The hop bitterness builds until you get to the back-end. Then at the back-end this unique hop experience just explodes with an additional release of carbonation during the swallow. At the finish you expect the bitterness to overwhelm the experience but it doesn’t. In the finish the sweet malts that were detected up front make there presence known. Nice almost caramel malt flavor along with a hop bite comprise the finish to this beer. The final aftertaste is a lingering hop bitterness and you still have a tingling sensation on the tongue. I’m not a hop head and IPA’s are my least favorite craft beer style but this APA is good. I can’t believe how much I’m enjoying such a hoppy brew. The hop flavors in the beer are very complex; the aromas on the nose, the mid-sip, back-end and the finish are all slightly different hop flavors. I guess you can tell that I’m not an expert on hops and I’m having a hard time explaining the unique hop flavors of these brew. Either I’m getting use to these hops or this beer in developing a maltier aspect to it as it warms. Either way I’m enjoying this more as it warms up a little. Well there is also a refreshing aspect to this beer; mainly noted by the fact that it’s gone already. All and all this has been a very enjoyable APA. I am really impressed with the hop flavors of this beer. I’m going for a B- on this one. This is a very nice APA with a very complex hop presence on a caramel malt backbone. Even with all of these hop flavors I still did not find the hop bitterness overwhelming.